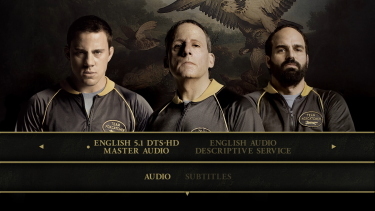 Description: Foxcatcher is a psychological drama directed by Academy Award nominee Bennett Miller (Moneyball) and starring Golden Globe winner Steve Carell, Channing Tatum, Academy Award nominee Mark Ruffalo, Academy Award winner Vanessa Redgrave and Sienna Miller. The film was written by E. Max Frye and Academy Award nominee Dan Futterman. 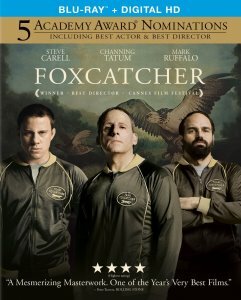 Foxcatcher tells the story of Olympic Gold Medal-winning wrestler Mark Schultz (Tatum), who sees a way out from the shadow of his more celebrated wrestling brother Dave (Ruffalo) and a life of poverty when he is summoned by eccentric multi-millionaire John du Pont (Carell) to move onto his estate and train for the 1988 Seoul Olympics. Desperate to gain the respect of his disapproving mother, du Pont begins "coaching" a world-class athletic team and, in the process, lures Mark into dangerous habits, breaks his confidence and drives him into a self-destructive spiral. 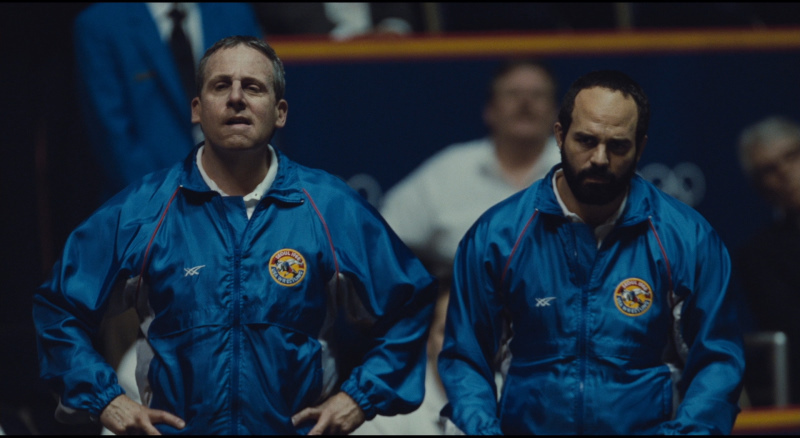 Based on actual events, Foxcatcher is a gripping and profoundly American story of fragile men who pinned their hopes for love and redemption on a desperate obsession for greatness that was to end in tragedy. 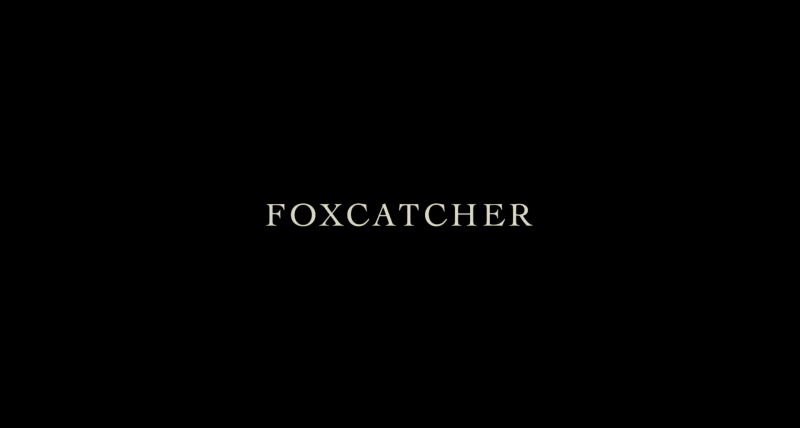 The title Foxcatcher refers to the 800-acre Pennsylvania estate owned by the wealthy du Pont family, where hunters on horseback chased foxes through the fields and packs of beagles tore the prey to bits. This is the blood sport of the privileged, which Oscar Wilde characterized as “the unspeakable in pursuit of the inedible,” which is something of the spirit of Bennett Miller’s superb new film. The three performances are anchored by a fiercely concentrated script from Dan Futterman (Capote) and E. Max Frye (Something Wild), which reveals the changing relationship of the three men over nine years, incrementally revealing layers of madness, privilege, repressed sexuality and eventual violence. Mr. Miller, however, wants more than just an ordinary American sideshow, and he unwisely tries to expand the story when just telling it would have been enough. At times he seems to be trying to resurrect the idea of two Americas that’s crucial to “Capote,” which tracks Truman Capote’s investigation into the murder of an ordinary family by a pair of killers. 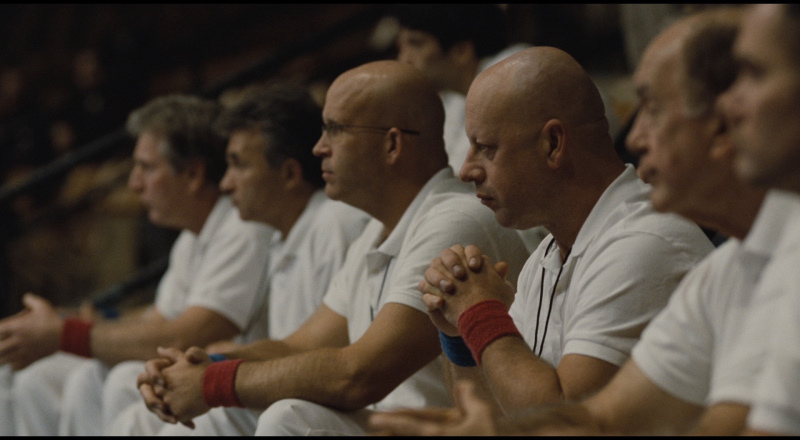 But there’s no one here like Capote to guide you through the murk and no one who gives the spectacle of human struggle its spark, as the baseball savant Billy Beane does in “Moneyball.” Mark and John make a fine odd couple in “Foxcatcher” (things get seriously weird at the farm), but they never evolve into the kind of deep, meaningful figures who can carry the weight of Mr. Miller’s symbolism and all those American flags. 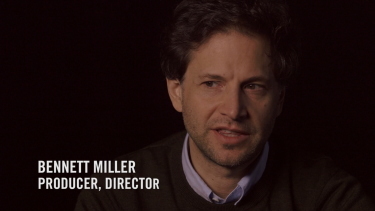 Mr. Miller does his finest work with his three superb leads, though I wish he had made more room for Mr. Ruffalo, who enters and exits as Dave flashes in and out of Mark’s life. Some of the best scenes in the movie are of the brothers, including an early one in which they train in their old gym, hitting and grasping in a pantomime of aggression and affection, the crowns of their heads touching like the antlers of young stags testing each other. 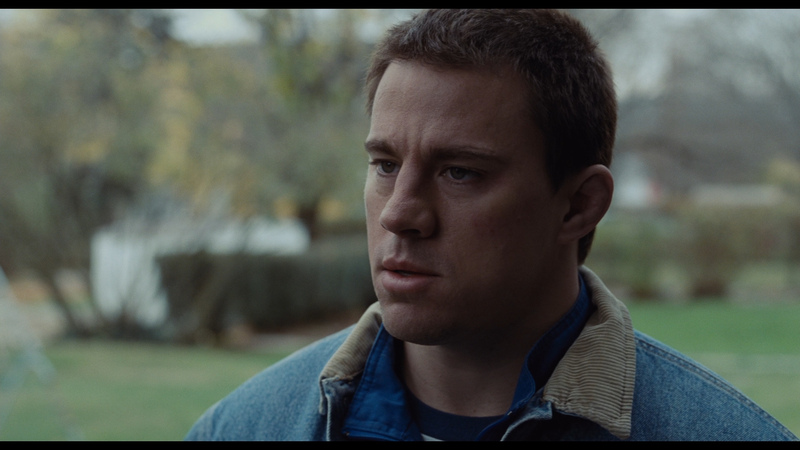 It’s rare to see such physical male intimacy on screen, especially among men not bonded by war. 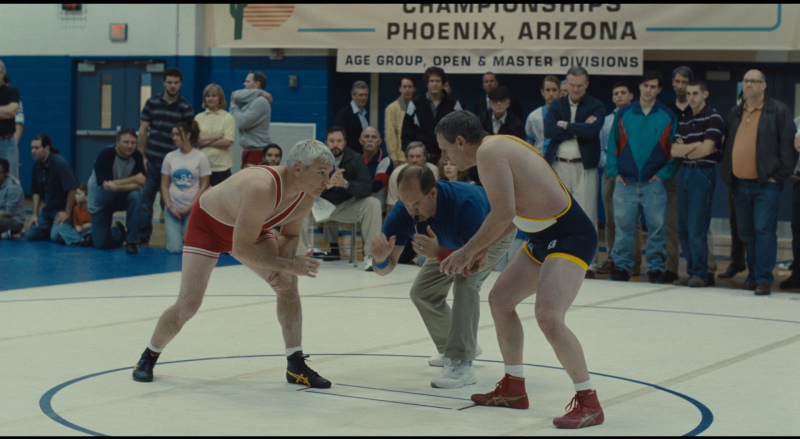 And it’s in the depictions of this intimacy, in its tangle of bodies and desires — the images of John squirming on top of and below other men say more than any of his pitiful speeches — that “Foxcatcher” rises to the occasion of real tragedy. 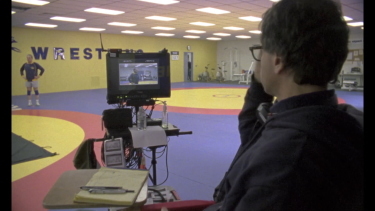 Foxcatcher was shot on 35mm, and displays some of that format's attributes on Sony's new Blu-ray. 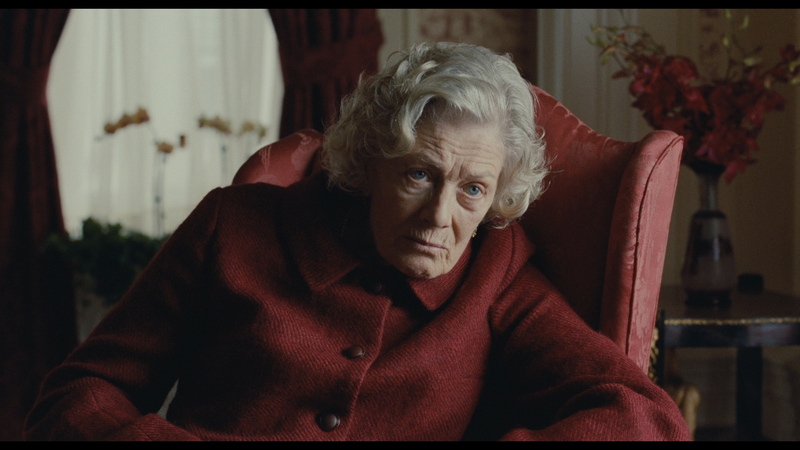 Firstly, kudos to Greig Fraser's cinematography, capturing moods and atmosphere. He nailed an 'East Coast old money'-style of the house and grounds with his movement, the 'cold' look of the large gym and the often ugly, discordant realism of the period. Brad Ricker's excellent art direction deserves mention as well. The 1080P visuals have an occasional teal-leaning but look quite solid. Its an often hand-held camera connoting the v�rit� aspects of the video presentation. Sometimes looking softish, notable in movement. It's a dual-layered transfer for the 2 1/4 hour film and the bitrate is supportive. This Blu-ray displays all the attributes of the theatrical film and provides a rewarding, consistent, and pristinely clean presentation. Sony use a DTS-HD Master 5.1 at a reasonably impacting 2081 kbps. Actually, the minor gunplay is some of the most aggressively deep I have heard on my system. It sounded more like a canon. The score is by Rob Simonsen ((500) Days of Summer) and suits the moody, dark film. There is some sneaky range (crowds etc.) and everything was crisp and consistent. There are optional subtitles, a French DUB, an audio descriptive track, and my Oppo has identified it as being a region 'A'-locked. There are some extras, although no commentary - that would have been appreciated. 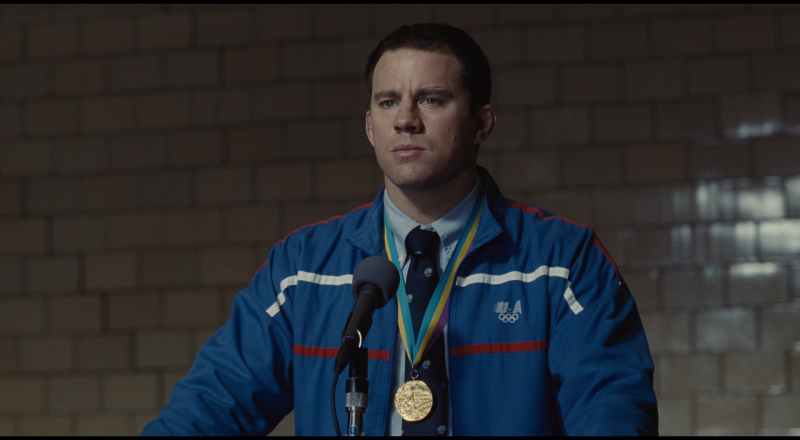 The Story of Foxcatcher is a 16-minuite video piece with Bennett Miller, Steve Carell, Channing Tatum and Mark Ruffalo sharing input into the production, how the film evolved and was its casting. There are also two deleted scenes entitled Conference Call and Where's Dave? They run about 5-minutes. There is a trailer and previews as well as the disc having Ultraviolet copy access. Frankly, I think the film deserved more supplements. Highly impacting film. Foxcatcher is brilliantly performed, paced and realized. I went in blind and was blown away. A fascinating story. I only wish there were more extras on the Sony Blu-ray. It's a highly authentic a/v presentation and a film that captures you, exploring a rarely seen topic with some alarming consequences. A very strong recommendation!